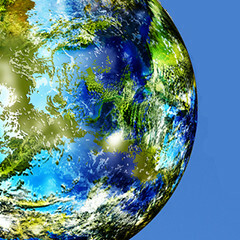 Advanced Energy Perspectives is AEE's blog presenting news, analysis, and commentary on creating an advanced energy economy. Top Left: TAEBA’s Suzanne Bertin addresses the room. Top Right: PUCT Chairman DeAnn T. Walker speaks to the group. Bottom Right: TAEBA members gathered at the Texas Capitol Jan. 31 to present the latest in advanced energy technologies and meet with policymakers and all three PUCT commissioners. L-R Top row: Alan Ash, Trane; Ned Bartlett, Veolia; Meghan Nutting, Sunnova; Sara Rafalson, EVgo; Doug Middleton, CLEAResult. Bottom row: Stephanie Byrd, Schneider Electric; Mark Stover, Apex Clean Energy; Suzanne Bertin, TAEBA; Mona Tierney-Lloyd, Enel X; and Bonnie Datta, Siemens. Not pictured: Beth O’Brien, Pattern Energy Group; Lynnae Willette, EDF Renewables; Chris Pasch and Matt Romero, CLEAResult; and Dave Savage, Apex Clean Energy. 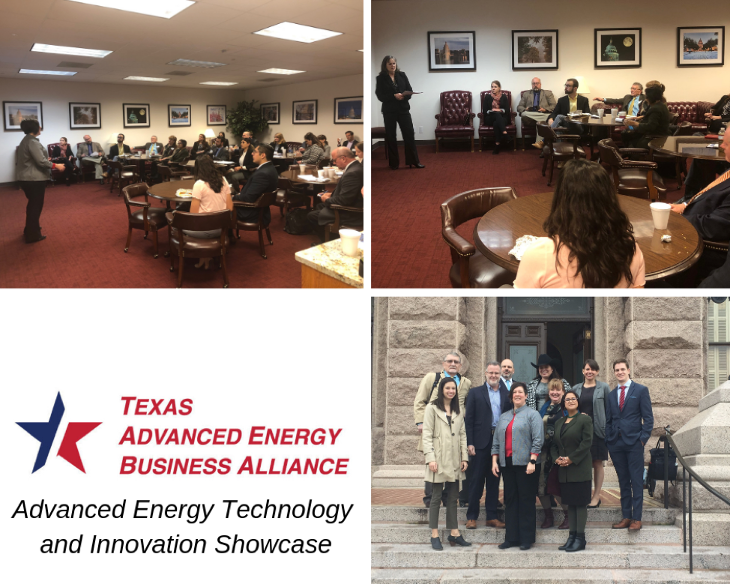 On Jan. 31, Texas Advanced Energy Business Alliance (TAEBA) hosted an "Advanced Energy Technology and Innovation Showcase" at the Texas Capitol to educate policymakers and staff on advanced energy across the Lone Star State. Company officials from TAEBA Leadership Council members Schneider Electric, Siemens, Enel X, Pattern Energy, Apex Clean Energy, CLEAResult, Trane, and Veolia gave presentations to House and Senate legislative staff. They covered the benefits of a broad range of technologies, including solar, wind, thermal storage, demand response, battery storage, combined heat and power, energy efficiency, electric vehicles, and port electrification. Also in attendance were representatives from the Governor’s, the Lieutenant Governor’s, and the Speaker’s offices; Public Utility Commission of Texas (PUCT) staff; Texas Commission on Environmental Quality Commissioner Emily Lindley; and TAEBA member companies EDF Renewables, EVgo, and Sunnova. PUCT commissioners participated in the showcase, with Chairman DeAnn Walker and Commissioner Arthur D’Andrea giving remarks at different sessions during the day. In their comments, both commissioners spoke about the important role advanced technologies play in the competitive Texas electricity market. TAEBA members met with Commissioner Shelly Botkin in a separate session later in the day to discuss the benefits of advanced energy in Texas. Wind is an economic driver: Beth O’Brien of Pattern Energy Group explained that Texas leads the nation in installed wind power, which brings in almost $1 billion in customer savings, injects $20 million a year into local economies, and employs more than 24,000 Texans, with wind technician one of the fastest growing job categories in the past five years. Solar energy is booming: Dave Savage of Apex Clean Energy covered solar energy technologies, featuring a major project for Fort Hood. He shared the growth opportunity for Texas, with more than 23,500 MW of solar projects under ERCOT review, allowing for growth in jobs and local revenues. Electric vehicles (EVs) reduce power rates for all: Bonnie Datta of Siemens explained that EVs deliver lower total cost of ownership for drivers, reduce electricity rates, provide greater efficiencies for the electric grid, and create new jobs with new skill sets. Microgrids add resilience to power system: Ned Bartlett of Veolia Energy Services showed how combined heat and power (CHP) microgrids can provide “a resilient and uninterrupted energy supply” for single buildings, large industrial complexes, or entire communities. Demand response and energy storage improve the grid: Mona Tierney-Lloyd of Enel X described how demand response and energy storage can support the grid and defer expensive substation upgrades by sharing the example of a solar, storage, and fuel cell system in a low-income housing development. Port electrification reduces costs, creates revenue: Stephanie Byrd of Schneider Electric reported that Texas ports generate $368.7 billion in economic activity and make up 22% of all U.S. tonnage. Powering berthed ships with onshore electricity (shore power) rather than diesel generators reduces fuel costs, lowers motor maintenance costs, and produces new revenue for ports. Thermal storage addresses peak demand: Alan Ash of Trane explained how thermal storage saves wind and solar energy for use during peak demand times. Energy efficiency is a big savings opportunity: Doug Middleton of CLEAResult shared how energy efficiency reduces cost from avoided power generation and capacity, lowers bills for customers, and creates local jobs and economic development. The Texas Legislature, which meets only in odd-numbered years, will be in session through Memorial Day. TAEBA plans to continue engagement with legislators, including an upcoming Lobby Day in March. Hope Jones is an AEE communications intern from Rollins College, Fla., completing American University’s Spring Internship program in Washington, D.C.. 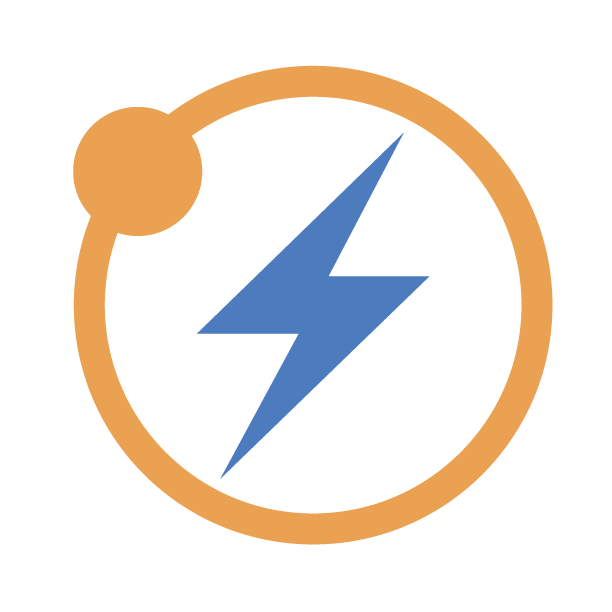 Learn more about how advanced energy benefits Texas at the link below. Thank Advanced Energy Economy for the Post! Considering investing $250,000 or less in a solar project? "Solar power, specifically PV, has grown rapidly since the turn of the century.